The following is a letter home to Limerick by Hamilton George and Mark O’Shaughnessy, following their journey to Australia in 1863. They were the sons of Mark Terry O’Shaughnessy, a coach a carriage agent in Thomas Street, (later 32 Catherine Street) and Jane Massey. The brothers had both enlisted in the R.I.C. in 1859. Hamilton, aged twenty-one at the time, and at almost six foot tall he had previously worked as a clerk. While Mark was only nineteen years old and he was almost five foot ten inches tall and worked as a labourer. Hamilton was a reserve in the RIC while Mark had been posted to Cork City. They both resigned to take their journey across the world together. The journal was kept mostly by Mark who referred to his brother as Hammy. March 23 – Beejauore towed out of Queenstown (Cobh) Harbour, March 23, 1863. When the ship was leaving, we found four young men stowed away without paying passage, which were sent to shore with a clergyman, companion of the Rev. Father Keating, who gave us three hearty cheers when leaving Queenstown harbour the inhabitants gave three cheers. A Mrs. Brown had her husband left behind by accident, on account of his going ashore and not returning in time; sailed little or nothing that day. March 24 – Sailed from one to two knots per hour; dancing and singing all that day up to 10 o’clock that night. March 25 – All sails flapping, no wind, day very calm; at 10 o’clock a steady breeze got up, and sailed six knots per hour up to 7 next morning. March 26 – Sailed six knots per hour; a birth at 4 o’clock p.m.; a great number of passengers sick all day. March 27 – Sailed same; lots of singing and dancing up to 9 o’clock p.m.; ship tossing very much. March 28 – Sailed seven knots per hour; music and dancing in all parts of the ship; reached the Western Ocean. March 29 – Sailed from half to one knot per hour. One of the mates caught a small shark at 12 o’clock; great excitement with the passengers to get to see it; got a breeze at 8 o’clock; went 8 knots all that night, also reached the coast of Spain. March 31 – Sailed 8 knots per hour; day rough. April 1 – Sailed from 9 to 10 knots per hour. Seen a very large whale at ½ past 2 o’clock; also seeing a large ship in sight, and several porpoises. April 3 – Ship sailed 8 to 10 knots per hour; sea rough, all things quiet. April 4 – Sailed from 11 to 12 knots per hour; a small ship in sight. April 5 – Ship sailed from 7 to 8 knots per hour; at half past 2 o’clock the doctor received a letter threatening his life, and from that out the constables had to stop up in their turn from 10 o’clock to 2 o’clock, and another from 2 to 6 o’clock in the morning had to stop near the doctor’s cabin at night and also to stop at the hatchway to prevent the girls coming up at night. The number of constables that were on board were 10, 5 Irish and 5 English. The duty we had to do was to get the lower deck scraped and swept every day three times; to go on duty at 7 o’clock in the morning until 10 o’clock at night, to keep the girls near the second cabin, not to let them near the young men that came up every fifth day, and to see that all the lights were put out at 10 o’clock to the minute; also to go on the galley every fourth night for a week to see that all passengers got their dinner, supper and breakfast also; reached the Tropic of Capricorn. April 6 – Sailed six knots per hour; sun very hot; saw several fish; a child thrown overboard at 7 o’clock. April 7 – Sailed from four to five knots per hour; sun very hot; could not sleep at night from the heat. April 8 – Sailed 11 knots per hour; a steady wind blowing; three cases of fever in hospital. April 9 – Sailed nine knots per hour; a birth at 2 o’clock; all things quiet. April 10 – Sailed same, a concert at half past 7 up to 9 o’clock; all put down at 10 o’clock like cattle. April 11 – Sailed seven knots per hour; saw several fishes; a second child thrown overboard at 9 o’clock, died of measles. April 12 – Sailed two knots per hour; mass celebrated by Rev Father Keating and spoke about the girl’s conduct on the previous night, and said that if they did not behave themselves that he would not give them a letter to the Bishop of Brisbane – also said he would have parties watching them from that out. At 2 o’clock lost one of our passengers named Dwyer, native of Tipperary – leaves six children after him, all very young and wife old; also the Rev. Father Keating said Mass over the body. April 13 – Sailed from one to two knots per hour; day very fine, and sun very hot; could not stop below to take dinner; had to come on deck that night, and most of the passengers could not stand the heat below. Slept on the deck during the hot weather, and all the passengers; all I could keep on me was one sheet over me in bed; in the middle of day one shirt, and drawers, and all the passengers the same. April 14 – Sailed same day and night. April 15 – Saw a ship, City of Mobile, from Calcutta, came alongside and took about 300 letters from the passengers, bound for London; lay alongside for a considerable time; a dead calm; also a great many bad with scurvy and itch. April 16 – Ship St John, from Melbourne, came along side, and also took letters from most of passengers; day not so hot; a third child thrown overboard at 7 o’clock; ship going from 3 to 4 knots per hour; also a birth at 4 o’clock. April 17 – Ship sailed one knot per hour; not so hot; crossed the line the next morning at half past 7 o’clock; the Captain said that we were very lucky in crossing it in the one day; the ship that we sent the letters by, City of Mobile, was 14 days crossing it. Also, the night we crossed it all the sailors went round the deck all dressed up, one as Neptune, playing round the deck five or six times. Some played flutes, some concertinas. On the next morning all the passengers made up a few £5 for them; got beer for them; dancing and singing in all parts of the ship. April 18 – Ship sailed same; all things quiet. April 20 – Sailed same. April 21 – Sailed 9 knots per hour; a fourth child thrown overboard at 2 o’clock. April 22 – Sailed from 10 to 11 knots per hour; day very wet. April 23 – Sailed from 7 to 9 knots per hour; on duty from 10 o’clock to 2 o’clock. In the morning a fight took place with some of the sailors, one mate and two sailors; all put in irons until next morning. April 24 – Sailed from 10 to 11 knots per hour; day very rough; all things quiet. April 25 – Sailed 10 knots per hour; at half past 5 o’clock lost one of our passengers named Collins, native of Kerry, married only four months, a runaway match. April 26 – Sailed 8 knots per hour; day very hot. April 27 – Sailed the same; all things quiet. April 28 – Dead calm; a birth at half-past 3 o’clock; near the coast of Brazille; most of the passengers and sailors bathed in the ocean. April 29 – Sailed same; a dead calm from the 26th to the 30th April. April 31 – Sailed from 9 to 10 knots per hour; at half-past 1 o’clock the morning of the 28th April a Mrs. Gillespie was thrown overboard. May 1 – Sailed from 10 to 11 knots per hour; reached the tropic near the Brazilian coast; sighted the three islands of Trinidad, known as the island of Sprita Santa. An Irishman named Knight [not further comment], an English girl named Alice Wild, dressed herself as a sailor and passed off as such to Doctor and Captain; nearly every night some of the girls used to dress up in men’s clothing; in the morning the Doctor and Captain heard about Miss Wild and dismissed her from the hospital; she was nurse there, and put an Irish girl in her place. May 2 – Sailed 7 knots per hour. A row at 2 o’clock below between Irish and English. May 3 – Sailed same; all quiet. May 4 – Sailed from 4 to 5 knots per hour; dancing and singing up to 8 o’clock; best players we had on board a married man, his wife and son, Irish. All used to play on flutes together, the best I ever heard; his wife used to sing splendidly; she was about 65 years of age. May 5 – Sailed 2 knots per hour. At 11 o’clock p.m. a heavy gale of wind carried away the jib, a head wind. A ship gone home to old Ireland landed at 8 o’clock; very wet thunder and lightening up to 8 o’clock p.m.
May 6 – Sailed 10 knots per hour; day wet and very rough. May 7 – Sailed same; all quiet. May 8 – Sailed from 3 to 4 knots per hour; day fine; dancing and singing in all parts of ship. May 9 – Sailed from 4 to 5 knots per hour; a fight between English and Irish. May 10 – Sailed from 2 to 5 knots per hour; day very fine, all quiet. 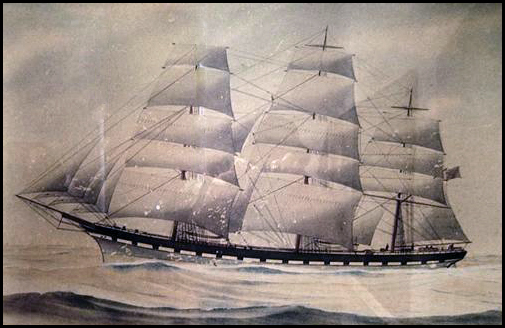 May 11 – Sailed from 11 to 12 knots per hour; day middling rough; a large bird perched on the yard. One of the sailors went aloft to catch it but failed; lay on the yard above it for all the day; also saw about 300 birds during the day; also a flight at 10 o’clock. May 12 – Sailed from 12 to 13 knots per hour; very wet and rough; also saw several Cape pigeons. May 13 – Sailed from 9 to 10 knots per hour; at half past 6 o’clock a fifth child thrown overboard, died of measles; at half-past 12 o’clock p.m. blew a heavy gale of wind; ship tossing so much; lost one of our foremasts; storm up to 6 o’clock. May 14 – Sailed 12 to 13 knots per hour; a child thrown overboard at 5 o’clock; day wet and rough, also cold. Also fights on lower deck nearly every day with English and Irish; only the Irish were so strong the English would walk into them. We have about 300 Lancashire paupers all getting out free; about 20 Scotch; all the rest Irish. May 15 – Sailed same. About 500 birds followed the ship all the day; also two large whales. May 16 – Sailed from 11 to 12 knots per hour; lost one of our foremasts; a sixth child thrown overboard at 6 o’clock; saw a very large grampus. May 17 – Sailed 6 knots per hour ; got clear of the Cape at 6 o’clock p.m.; all in one day; very luckily got into the Indian Ocean at 7 o’c. The eight child thrown overboard at 4 o’clock. May 18 – Sailed from 10 to 11 knots per hour; a very heavy sea; the ninth child at 8 o’c. thrown overboard. May 20 – Sailed same, sea rough; dancing all day. May 21 – Sailed 12 knots per hour; day clear and cold; a tenth child at 2 o’c. thrown overboard; all passengers sunning on deck all day to keep warm; two children at 6 o’clock thrown overboard. May 22 – Sailed 8 knots per hour; day cold; passengers all playing on deck to keep warm; two children at 6 o’clock thrown overboard. May 23 – Sailed from 6 to 6 knots per hour; at 2 o’c., the jib-stay carried away. May 24 – Sailed 9 knots per hour; day cold and wet; at 8 o’clock most of the passengers went to bed; could not sleep that night the ship tossing; knocked from one side of berths to the other at 12 o’c. p.m. On duty until 6 o’clock in the morning; minding girls from coming upon deck. May 25 – Sailed 11 to 12 knots per hour; regular mountains of sea; ship rolling much; boxes and tins knocked about like turf in all parts of the ship all day. May 26 – Sailed 10 knots per hour; at 6 o’clock got up and went on deck, found all the deck covered with snow; the day very cold, thunder and lightning; 9 o’clock to bed. Could not sleep that night with the heaving of the ship; boxes and tins tossed from one side to the other. A London prig thought to steal our bacon hanging up in our room. Seeing the fellow myseld, I pounced out of bed, but the prig made off like the very devil; made fast the door with boxes and locked up the bacon at 12 o’clock. A wave over the starboard side rolled on deck like a fall of thunder, came down hatchway, made all passengers shout out that the ship was going down, to get up and pray, A great many got up and commenced to pray. May 27 – Sailed to 11 knots per hour. Day very cold; rough sea at 8 o’clock; a birth at 9 o’clock. One of the passengers got his collar-bone dislocated; he fell on deck. Hammy and myself had to bring him down to bed by order of the doctor. May 28 – Sailed 11 to 12 knots per hour. At 12 o’clock a sad accident happened to a young man age 20, Robert Campion, a native of Kilkenny, who slept in the same room with us – next berth to Hammy. While walking a deck, smoking, he was caught by the sail flapping at the time, which threw the poor fellow overboard. Hammy, myself and his brother were in our room when we heard some of the passengers sing out that someone was overboard. We ran up on the deck; all the passengers were crowded together, looking at the lifeboat lowered and manned with six sailors; but all to no use. I afterwards heard that the poor fellow made a grasp at a sheep skin that was outside of the ship washing. Two more brothers in a similar way were lost going to America, and another died two days after landing; he was support of his only sister. June 2 – Sailed 7 to 8 knots per hour; a child thrown overboard at 12 o’clock; day fine. On the first of June I forgot to mention a child was thrown overboard and deck covered with snow. June 3 – Sailed 10 to 11 knots per hour; day fine. A small boom was carried away. At 12 o’clock a child was thrown overboard. At 6 o’clock had several showers of snow, the men of the passengers were pelting snowballs all day. June 4 – Sailed 9 knots per hour. At half-past 4 o’clock the deck was covered in snow. June 5 – Sailed 7 knots per hour; day fine. June 6 – Sailed 7 knots per hour; three children thrown overboard – at 8 o’clock, one at 4 and one at 10. June 7 – Sailed same day; middling rough,, ship tossing much. June 8 – Sailed 10 knots per hour; day extremely cold; two children thrown overboard, one at 6 o’clock, one at 10; also another child, a birth at 12 o’clock. June 9 – Sailed 10 knots per hour; two children thrown overboard at 10 o’clock a.m.; day fine, sea calm, saw a large bird. June 10 – Sailed 5 knots per hour up to 7 o’clock, when we got up a good stiff breeze and sailed 11 knots per hour; day fine; two children thrown overboard at 9 o’clock. At 7 p.m. the alarm was given that the ship was on fire on the lower deck. The fire was reported to be in Number 5 berth. All the passengers were running here and there, but found that it was a sling lamp that took fire. It was taken by a passenger and thrown overboard. Only for it being thrown over so soon all the beds would take fire; children and women shouting in all parts of ship; the captain got the hose and buckets ready; some of the men ran into the small boat. June 11 – Sailed 9 knots per hour. At 4 o’clock had a great spree in the girls’ own place; got two bottles of wine from captain and two from first cabin passengers, and got more themselves; only five first cabin passengers; on duty that night at the hatchway; no man allowed down there; also passed Vandieman’s Land; did not come in sight of it. June 12 – Sailed 5 knots per hour; day fine. At half-past 3 o’clock a child thrown overboard; also another at 8 o’clock. June 13 – Sailed 6 knots per hour; a birth at 2 o’clock; singing and dancing all day. At 10 o’clock a row between the doctor and passengers, and only for the priest and the captain coming down so soon they would tear the doctor to pieces – he was a very cranky little fellow, the dead spit of Headley that was in the gas office; he was a German. June 14 – Sailed from 1 to 2 knots per hour. At 12 o’clock ship gone an hour out of its course; a child thrown overboard at half-past 2 o’clock; a birth, and then at 4 o’clock a very heavy gale tore the main sail to pieces. At 10 o’clock the Rev. Mr Keating celebrated Mass and spoke about the row on Sunday night – gave all present a great lecture; every day he celebrated Mass he had something to say. June 15 – Sailed five knots per hour; day fine; a birth at 2 o’clock; passengers making preparation to go ashore to Rockhampton; the second ship that ever went there. About 5 hundred miles from Rockhampton also saw a ship in sight; all the passengers in great glee being so near shore. Hammy and myself washing dirty clothes; only for the provisions we brought we would be half starved. They do not give half enough to any of the passengers; what is given for ten in a mess is only fit for three. It is a great pity that someone does not represent the treatment passengers get on board. Everything is bad; not fit for a dog. After 14 days out the water was terrible, and all the way same, like water taken out of the sink. It was terrible. If I was going out again, I would know what to bring. If anyone is going out from Limerick, tell them to bring such – flour, jam, fancy biscuits, straw hats, white trousers, white coats, preserved milk, clay pipes, and could with the greatest ease make £60 on the passengers. Before we crossed the line we bought from one of the passengers a lot of straw hats, and we made one shilling each on them. At 9 o’clock a birth. June 17 – Sailed 5 knots per hour; day fine; singing all night; about 900 miles from Keppel Bay; nothing particular during day. June 18 – Sailed out of one course; hard wind all that day; thunder and lightening and heavy rain; all sails taken in; sea rough; hail and snow taken in the evening. At 12 o’clock changed again for the worst; the lightening as so bad the sailors were afraid to step on deck; you could see a pin. June 19 – Sailed little or nothing; great lightening; also on that night. All put below very early. June 20 – Sailed from 9 to 10 knots per hour to 7 o’clock and then we had a hard wind all night; gone out of our course at 8 o’clock. The married people had a great spree in their own department. The captain gave them a bag of flour, and they all gave 6d. each towards getting some brand, ale and porter. The priest and doctor went down to them and made a great speech; got leave to keep the lights on until 12 o’clock. None of the single men or women would be allowed near them. June 21 – Sailed 12 knots per hour; day fine. At 4 o’clock in the morning, I got a terrible fright. Some of the passengers shouted out “fire!” I was half asleep; great confusion; all shouting “fire! Fire!” I was certain the ship went to the bottom; it was a very rough night; it was a ship light took fire. Most of the passengers came on deck with their blankets rolled about them; it was terrible to the shouting of them. At 11 o’clock next morning, thank God, we saw land; sandy islands, about 100 miles from Kepple Bay; did not go near it – twenty miles to it. Day fine; all passengers in great joy. I forgot two days we passed Brisbane. It is a terrible passage to undertake. It gives a young person as much as he can to bring himself over the passage; nearly every night something up – robbing one another. June 22 – Sailed same; saw more land; day fine; dancing and singing all day. I often think how we came so safe. June 23 – Sailed out of our course; saw Port Curtis about 15 miles from us. Day very fair; all passengers up all night in great spirits. June 24 – Sailed 4 to 5 knots per hour; very near out destination; all in great humour. At 6 o’c. the Captain cast anchor; was afraid to carry on any more; coast very dangerous; land at each side. At 5 o’clock in the morning got up the anchor and set sail; day very fine; saw the steamer going to Brisbane. At 2 o’clock a small boat came alongside and the pilot came aboard; great cheering with all the passengers; all round the men that came into the ship asking them questions. At 6 o’clock a.m. cast anchor for good; very splendid evening. All round, up to the day cast anchor we had 37 deaths and 10 births. Thirty-three of the former were children, and four adults, one of them was drowned. Stopt [sic] on board until the steamer came from Rockhampton. On the next day the steamer took most of the passengers. Some stopt [sic] on board for Brisbane; most volunteers for Rockhampton. We also volunteered for Rockhampton. We could stop if we liked to go to Brisbane. All the Lanarkshires [sic] were for Rockhampton and that was the reason they out in for that port first. We were advised to go to Rockhampton by Father Keating, as the wages were higher there. We were offered £40 a year with rations to go off as shepherds. We refused it. We should bind ourselves for 12 months each; the distance we would have to go 300 miles up the bush; and I suppose if we went we would not be able to write to you for the next 12 months. This is not the country they represented; it is a wild country. We saw several of the blacks without a stitch of clothing on them. There are several men that go up the bush that we never heard of, murdered by those fellows. Lodging is very dear here – one pound per week- mere boxes. All the houses are made of wood, like cabins at home. All the sailors on board were put in gaol. The day we left for three months, we are so knocked about that cannot write much, but we will write a long letter with all particulars next mail, if we do not go up the bush. This place is 350 miles from Brisbane. We has a good passage of 92 days and 14 hours. Had we called at Moreton Bay first, the “Golden Dream” would only beat us nine or ten day, and we were glad to get ashore out of the ship. We hope soon to send you a cheque, so goodbye and God bless you all. I send two papers y this post and when you read them send them to Mr C– of Cork and apprise him of our safe arrival in Queensland. I am at a loss as to what the married people will do; few of them got employment as yet. All the single men are gone up the bush. The only thing I can compare this place too is a races at home – all timber houses. The town is very small. We expect all the passengers of the steamer up to-day. We are thinking of going to Sydney; there is nothing doing in Brisbane. There are too many ships going there. Both brothers did travel on to Sydney where on May 9, 1866 at St Augustine’s Church, Balmain, Sydney Hamilton married Kate Louisa Brennan, who was also a native of Ireland. They had four children. Mark lived until 1922 and was buried in Rookwood cemetery, Sydney. Their sister Ellen Massy O’Shaughnessy would later follow them to Australia. The letter was reproduced in the Limerick Chronicle in four parts over August 1963.